We’re barely a month into 2016 and sneakerheads already have their calendars mapped out. This is a culture currently saturated by high-end collaborations and exclusivity, luxury materials and Yeezy. In that sense, you probably wouldn’t expect the Nike Air Force 1 to make a push this year. Uptowns might be the best-selling athletic silhouette ever, but they’re known more for their versatility and everyman qualities than anything else. To its credit, the Air Force 1 will always be relevant not only for its simplicity but also because of its history. Before the days of Nelly and Rasheed Wallace, the Air Force 1 was a 1972 creation by Swoosh designer Bruce Kilgore. The shoe featured a “Pivot Point” on the sole and was inspired by everything from hiking boots to the Cathedral of Notre-Dame. It was actually Nike Air’s first basketball sneaker and later became the brand’s first retro as well. And though the low-top edition is certainly less celebrated than its taller brothers in 2016, it still has its place. 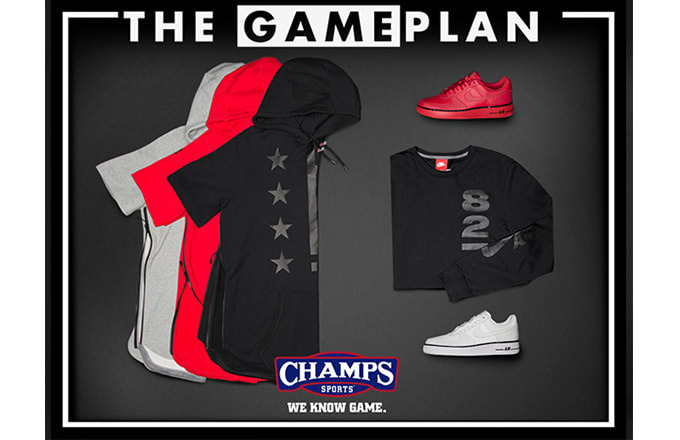 In the latest “Pivot Pack” Game Plan collection from Champs Sports, the Air Force 1 Low plays a central part. Between both white and red-based pairs, the Air Force 1 gives off an edgier vibe here, which is only amplified by the accompanying Pivot Hoodie and long-sleeve branded T-shirt. As we get closer to warmer weather—hopefully—this fit is a well-executed attempt by Nike to blend high-fashion streetwear with casual athletic gear. The French terry hoodie, in particular, has been perfected for layering. With a curved hem, Kangaroo pocket, and side zips running from the sleeves to the hem, it’s a look that many of you will have in your rotation this year. This will be a big year for the Nike Air Force 1. Don’t sleep.